Specifically designed and manufactured to provide CRYSTAL-CLEAR, communications to help create a safer work environment, which increases productivity and lowers the risk of liability. Pictured: HoistCom 120EV (Left), HoistCom E (Right). Mainly used on construction and temporary Hoists / Elevators, it is recommended by OSHA, and also considered the industry standard in the USA, Canada and Australia. Communications is critical to provide workers a way to contact the elevator operator in case of an emergency. When a worker is hurt or suffers a heart attack, seconds count to get medical attention to that person. Also as a general intercom system, allowing supervisors and workers to locate and communicate with each other. The down time that it takes to find personnel and to manage workers is reduced tremendously, thereby adding to the profit of the project. Powered by safe 24 volts DC. Emergency alarm switches on all units. Operates in extreme weather conditions. Backup battery power supply for Car unit. Heavy duty composite Nylon Plastic enclosure. Up to 6 Multiple Frequency channels selection. Microphone gain adjustment, for control of feedback. Mute function, limits amount of Com units that broadcast. (Especially helpful in a built up residential area where noise abatement may be imposed). 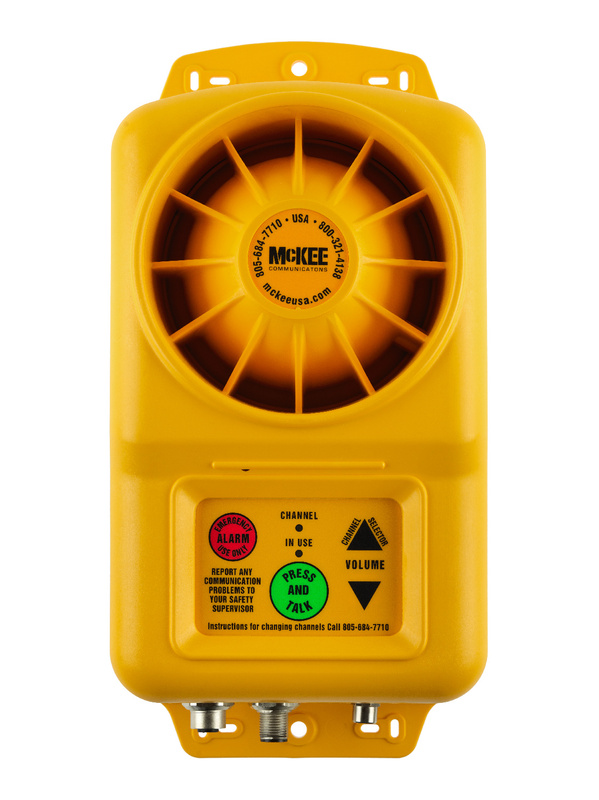 A new product by McKee Communications, the 130 HoistCom is designed and built for particularly loud locations. 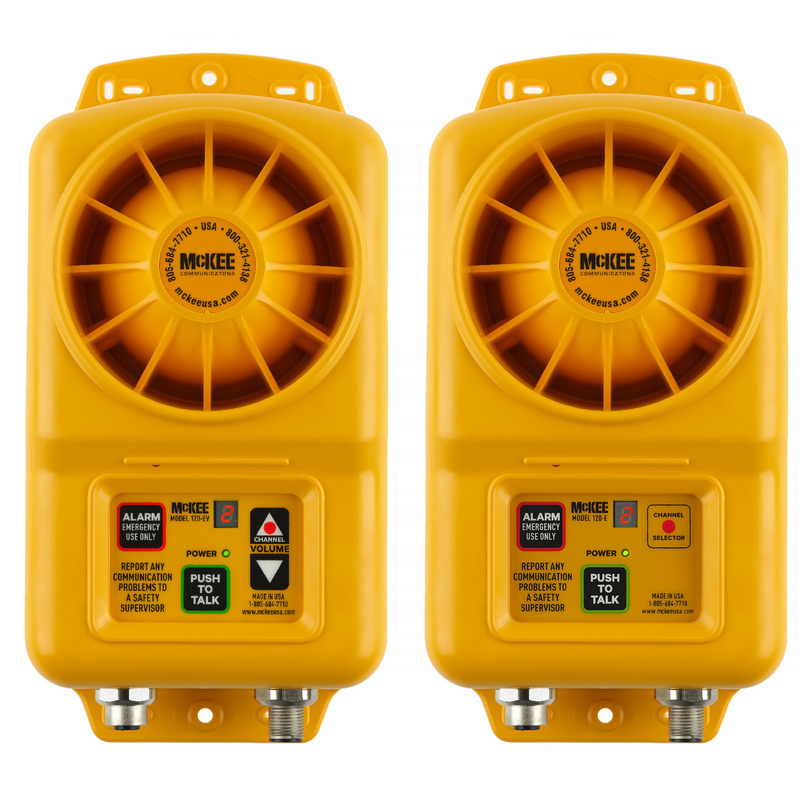 The 130 HoistCom achieves louder decibel levels for broadcasting voice communications and alarm signals by incorporating a larger built-in speaker housed in a larger housing. The 130 HoistCom is fully compatible with the 120 HoistCom system and is engineered to enhance an existing system when extra loud broadcasting is required. Contact McKee Communications for more information.